Persistence Market Research has developed an exclusive market study on outboard engines, delivering insightful forecasts and precision analysis across global perimeters. The report provides a strong and conclusive infusion of primary and secondary research findings, which has been directed to develop accurate market size estimations for the approaching years. The report, titled “Outboard Engine Market: Global Industry Analysis (2012-206) and Forecast (2017-2026),” offers an in-depth analysis on the global outboard engines market for the forecast period, 2017-2026. Extensive primary interviews have been conducted by our analysts for assessing the actual undercurrents of the global outboard engines market. From key stakeholders in maritime business and automotive industry to leading manufacturers of industrial equipment, outboard engines have been a key commodity for a range of companies, institutions and manufacturing associations. The report has been developed by a team of analysts, research consultants and subject matter experts, creating a cluster of multifaceted information and knowledge. From data crunching and statistical analysis to extensive company profiling and applied analytics, the report serves as a credible document for companies partaking in the global expansion of the outboard engines market. The report offers market size estimations and valuations in US dollars (US$), which enables it to facilitate universal understanding. The report offers inferences that can be repurposed as actionable insights for developing strategies towards business growth. The market segmentation mentioned above has been developed by weighing the subjective as well as the objective elements of the global outboard engines market. 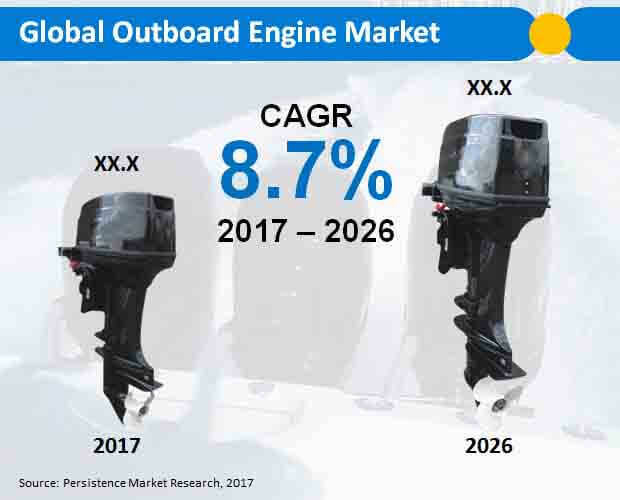 Unbiased research approaches and 24X7 query assistance are also the additional features of Persistence Market Research’s report on the global outboard engine market. In the recent years, outboard motor technology has advanced to the point where outboard engines are fuel efficient, more reliable, and weigh less as compared to the models of the past. In order to enhance the boating experience, manufacturers are moving towards combining the right boat powered by the best outboard engine. Instead of choosing the size of the outboard as per the manufacturers maximum allowed capacity, some of the customers are also going for the smaller outboard engine, especially in the case of shallow drafts. The weight of the outboard engine is also being considered by customers along with the hull design and draft, as they all affect the overall performance of the boat. With the modernization of pontoon boats, the demand for larger horsepower outboards has increased. Moreover, the development of multi-engine pontoons by several manufacturers is also driving the demand for outboard engines. Manufacturers are focusing on offering super-efficient outboard engines, they are also preparing outboard engines for winters in such a way that the user don’t need to inject antifreeze in the cooling system, as the outboard engine will automatically flush out the water. There has also been an increase in demand for higher horsepower outboard engine models in racks of two, three, and four by sportsboats. The growing trend of recreational boating and rise in the preference for personal watercrafts are also contributing to the growth of outboard engine market. Four stroke electronic fuel injection technology is expected to witness robust growth during the forecast period 2017-2026. By the end of 2026, four stroke electronic fuel injection technology is estimated to reach nearly US$ 3,500 million revenue. Medium power outboard engine is estimated to account for nearly half of the revenue share by the end of 2017. Medium power outboard engine is projected to surpass US$ 3,400 million revenue by 2026 end. Meanwhile, high power outboard engine is also expected to witness significant growth during 2017-2026. Outboard engine with electric start is expected to witness strong growth during the forecast period 2017-2026. Outboard engine with electric start is estimated to create an incremental opportunity of more than US$ 3,000 million between 2017 and 2026. Compared to the various boats, fishing boats are likely to emerge as the largest users of the outboard engines. Witnessing a strong growth between 2017 and 2026, fishing boats are projected to bring in nearly US$ 3,700 million by the end of 2026. Meanwhile, recreational boats are also expected to witness robust growth during 2017-2026. Europe is likely to emerge as the largest region in the global outboard engine market during the forecast period 2017-2026. Presence of the key market players and increasing participation in the water recreational activities are some of the factors contributing towards the growth of the market in Europe. Meanwhile, North America is also expected to witness growth, owing to the increasing preference for high power outboard engine. Some of the key market players in the global outboard engine market are DEUTZ Aktiengesellschaft, Honda Motor Co., Ltd., Brunswick Corporation, Suzuki Motor Corporation, BRP Inc., Tohatsu Corporation, Yamaha Motor Co., Ltd., Johnson Outdoors Inc., LEHR, LLC, and Kräutler Elektromaschinen Gmbh.